The West Highland White Terrier is an elegant-looking dog breed with a compact, sturdy body, small enough and with short enough legs to go where its quarry would take it. Its tail must be long enough to enable its master to pull it from holes. This dog breed is very affectionate and loves human and animal companionship. West Highland White Terriers are affectionate but stubborn. The West Highland White Terrier originated in Scotland. West Highland White Terriers range from 10 inches to 11 inches. West Highland White Terriers range from 15 to 22 pounds. West Highland White Terriers are typically white. 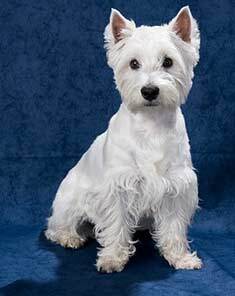 West Highland White Terriers have a double coat that is wiry on the outside and soft on the inside. Regular grooming is required to keep the coat clean and free of tangles. The West Highland White Terrier is a very independent and stubborn dog breed. Affectionate with its owners, the West Highland White Terrier can be timid around strangers and dislikes roughhousing. The West Highland White Terrier is susceptible to patellar luxation, skin problems, hernias and liver disease. The expected life span of the West Highland White Terrier is 12-14 years. West Highland White Terriers do well in apartments. This dog breed is as active indoors as it is outdoors. West Highland White Terrier love the companionship of humans and other dogs. The West Highland White Terrier is in the Terrier Group. If you've ever seen a can of Cesar brand dog food, you've seen the adorable West Highland White Terrier, perhaps better known as the Westie. Their piercing bright eyes, short tail, and small pointed ears are very distinctive, as are their teeth, which are fairly large for such a small dog. The mouth comes together in a scissors bite, whereby the lower canines are locked in front of the upper canines, while the upper incisors are locked over the lower incisors. Standing 9 - 11 inches tall at the withers, the Westie usually weighs somewhere between 13 and 20 pounds. Females are usually at the lower end of that weight range, while males are at the higher end. 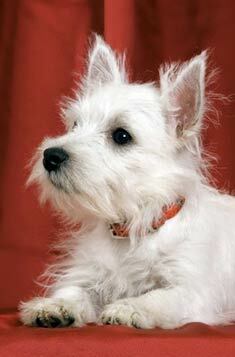 Irresistible little Westies have piercing eyes and alert pointy ears. The West Highland White Terrier is a double coated dog. The soft, dense undercoat is covered with a rough outer coat about 2 inches long. As the name implies, most Westies are white, but some have wheaten colored tippings on their outer coat. The fur does not shed excessively, but the dog does require regular grooming to pull out dead hair from the undercoat. Their paws are slightly webbed with thick pads. Allergies and dry skin issues plague this breed. Westie guardians must strike a balance between bathing enough to keep the coat clean and bathing too much which will dry out the skin. To help you manage this issue, remember that brushing can make a fairly good substitute for bathing by pulling out loose hair and removing loose dirt. White powdered chalk or corn starch can be sprinkled on the coat, then brushed out to encourage the fur to give up caked-on dirt. Weekly or more frequent brushing will also help to remove tangles and keep oils distributed through the dog's coat. When you do bathe a Westie, a gentle shampoo should be used. Look for one that is detergent-free and made for babies or those with sensitive skin. The insides of the ears should be swabbed out with cotton balls soaked in rubbing alcohol or hydrogen peroxide to prevent wax build-up. The West Highland White Terrier was originally bred in Scotland for hunting and vermin control, although there is some discussion among dog historians as to who originated the breed. Some sources credit Colonel Edward Donald Malcolm of Poltalloch in western Scotland. Others say the 8th Duke of Argyll, Chieftain of Clan Campbell, was responsible. It is entirely possible that the two men worked together to produce the desired characteristics of the Westie. In either case, the primary ancestor of the Westie was the Cairn Terrier and Scottish Terrier. When either of these dogs whelped a white puppy, the puppy was subsequently selectively bred to produce all-white litters. It was important to them that the dog be white, making him highly visible when used for hunting on the Scottish moors. Brown dogs had been used for hunting, but were often shot by hunters who mistook them for foxes. In addition, the dog had to be strong, yet small enough and fast enough to track rabbits, squirrels, mice, foxes, and badgers. The dogs were originally called Polltalloch Terriers or Roseneath Terriers, after the homes of Malcolm and the 8th Duke of Argyll, respectively. As the dog developed into a distinctive breed, the name was changed to reflect the more general area of Scotland, the western highlands. The Westie is generally a healthy dog, but there are a few conditions to which it is prone. Westie Lung Disease, more properly known as Idiopathic Pulmonary Fibrosis, is the result of chronic inflammation of the alveoli of the lungs. This may be the end result of the allergies so common to this breed. As inflammation continues in the lungs, it produces scarring of the alveoli (air sacs) and the connective tissue between them. If your dog is having a hard time breathing, especially during exercise, you might want to have your vet listen to his lungs. Crackles are indicative of the disease, as is a dry cough. The dog's heart may become enlarged as it has to work harder to pump blood to the fibrosed lungs. The disease usually starts producing symptoms when a Westie is about nine years old, and will likely kill the dog within 2 years. Treatment is available to make the dog more comfortable, and care must be taken to prevent respiratory tract infections. Exercise should be limited, but the dog must be kept from becoming obese. The Westie Foundation of America is funding research into the disease and possible specific diagnostic tests and treatment. Thought to be caused by mild inflammation of the cerebellum portion of the brain, this disease typically effects small dogs, and seems to have a propensity to attack Westies. The disease typically begins before age three, when the dog suddenly develops a tremor that persists throughout the day. The tremor typically becomes worse when the dog is held, is excited, or is stressed. You may also notice other nervous system problems, such as the head being tilted to one side, seizures, or one or more limbs becoming weak. There is no specific treatment, but the dog may have to be hand fed for awhile at the beginning of the disease. Eventually, he will be able to eat normally again. Your vet may give the dog Valium to keep him calm and steroids to reduce the inflammation. The condition does go away with proper treatment, although you may see relapses during times of stress. The fun-loving Westie is full of energy. They are independent and may not like to be held for long periods. However, like most dogs, the Westie will sleep at least 13 hours a day. He will sleep near you at night, then take naps during the day when he can't find anyone to play with him. They are people-oriented and will often follow you from room to room throughout your day. This might not be the best choice of breed for someone who is away at work all day, as the dog will make his own entertainment if you are not around. He is a prodigious digger and should only be allowed in your garden during plowing time in the spring! The Westie never met a stranger, but they will bark if they sense danger. They are friendly with children, as long as the child is old enough to realize that tails are not meant for pulling. 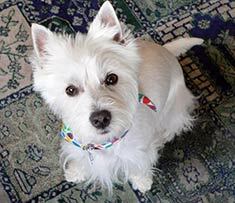 If you are looking for a fun-loving companion who will not need much grooming, the Westie will be perfect for you. However, if you want a cuddler or a watchdog, you may want to look elsewhere. Find West Highland White Terrier Puppies with our Free Breeder search!